This pillow case is as advertised, a beautiful silky satin feel. It has a strong hidden zipper, I love this feature because it keeps the pillow in place. It washes well, I recommend highly. 100% Polyester Imported PROTECTS YOUR HAIR AND SKIN. Satin pillowcases are one of life's simple pleasures. They're silky soft against your skin, reducing facial creases and wrinkles. Satin pillow cases also keep your hair safe from harm, preventing matting, breakage, tangling and snagging. You will wake up each morning with healthy skin and beautiful hair. COMFORTABLE AND DURABLE. Cool in the summer and warm in the winter, a satin pillowcase is a luxury to be enjoyed throughout the year. 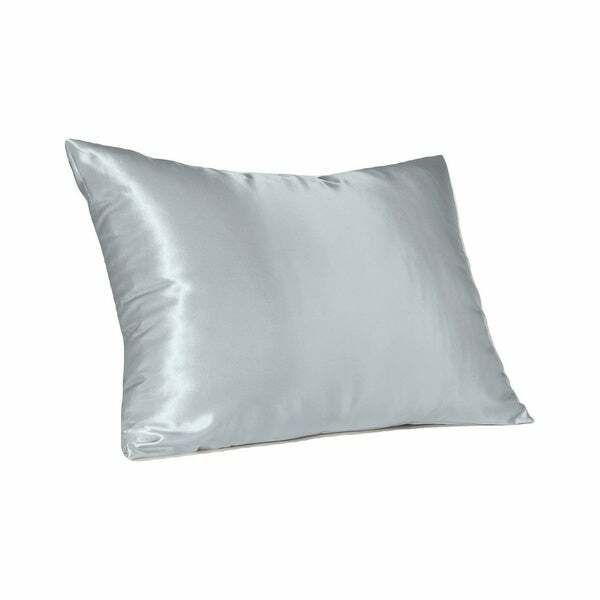 Our Satin Pillow case is made with high quality 300 thread-count 100% polyester fabric for optimal softness and easy care. The hidden zipper closure prevents slipping and ensures that the pillow stays perfectly in the pillowcase. LOADS OF COLORS. We offer a fabulous selection of colors, from soft tones to bright tones of color, you're sure to find a satin pillowcase that complements your decor. Sweet Dreams Satin Pillowcases are available in: black, brown, burgundy, camel, champagne, gold, grape, hunter, ivory, jewel blue, light blue, lavender, navy, pewter, pink, red, rose, royal, sage, seafoam, teal, yellow, black zebra print, brown zebra print, jaguar print, leopard print, and white satin pillowcase. TOP QUALITY CONSTRUCTION. Experience the luxury of our Sweet Dreams satin pillow cases. These satin pillowcases are constructed from 100% woven polyester which gives it its smooth finish and exceptional longevity, even after extensive wash and wear. Wrinkle free, stain and fade resistant, easy to care for, machine wash cold, tumble dry low. I love my Sweet Dreams Silky Satin Pillow Case. It has a hidden zipper.,love that feature. I wanted to wait to write review after washing more than once. The pillowcases are great quality , washes very well. And keeps my hair soft and silky. WOW! Great for hair and skin! I just wish I had known about them twenty years ago! It's amazing! It's with thick, heavy duty material, this is not going to tear easily at all! CHIC & SUPER SMOOTH Plus SOFT! Nice and feminine. I’ve received lots of compliments. Plus a conversation starter for sure, eh? Without reading others’ reviews, I JUST bought it instantly, just FYI and there we go: an excellent choice! The delivery was fast and the quality is with compliment. I highly recommend to friends and family. I really love this pillowcase! Not only is it super cute, but it really does what it's supposed to as far as preserving your hair overnight. As a member of the Natural Hair Community, a satin pillowcase is a MUST and this pillowcase really gets the job done! (What more? Another two orders of GOLD Color Euro Sham covers for my Two firm Euro Shams are arriving tomorrow, so period!!) Love it! Absolutely love it!!!! Ordered King pewter/taupe color and this was the perfect color I needed to add a little something extra to the bed. Not forgoing the fact that I firmly believe that sleeping on the satin cases (or silk if you choose) make such a difference in the way I look and feel when I wake up in the morning. This design with the hidden zipper is my favorite style; maybe a few $ more than several other satin cases I've ordered, but worth it. The satin weave is also a bit tighter from this brand, making them initially a little stiffer fabric, but once washed, they soften up very nicely. 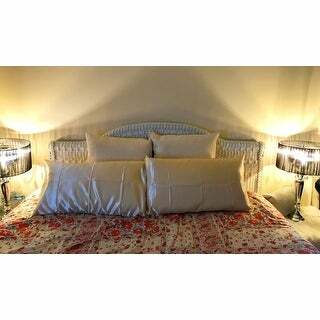 Love the silky satin pillow cover. I purchased them to keep my hair from getting tangled. I have long hair that can easily turn into a tangled mess. After purchasing the pillow cases, I have found that it feels soft to my face and my hair glides over the pillow case. I have washed the pillow cases several times and they wash very well. I haven't dried them in the dryer, I hang them up to dry. I am quite pleased with my purchase. They look lovely on the bed as well. I appreciate the quality of this cover. The fabric washes/drys well with no wrinkles making sleeping more comfortable. The fabric is actually healthier for my hair. I chose Champagne color which is a nice balance with our light -to-medium color taupe color sheets. I would purchase again. I love my new satin pillowcases it's great for my hair and face. I have hair down to my waist and have for my whole 50 years of my life. This pillow case does not snag my hair and it is also good to prevent wrinkles on the side of your face when you wake up. I do recommend these. The pillowcase is wonderful, it washes and dries beautifully. The material is very nice and I like the zipper enclosure to keep it on the pillow. I would recommend this pillowcase for anyone. great pillowcasel but does not keep hair from matting down as I thought.. Perfect color and very silky soft. Well made, with quality zippers to hold in pillow. I ordered 2 standard and 2 Euro size and they are both roomy. My order was incorrect however, I ordered 2 of each size and received only 3 cases. Hopefully, it gets cleared up. Excellent! Price is great. Just what i wanted! How have I waited so long to try this?? I love my satin pillow cases. Sleep like a baby on them. They wash well and haven’t gotten snagged up on things like some satins do. The zipper has held up well too! Very happy with my purchase. Why would I spend hundreds of dollars on face creams and facials if I’m not going to sleep on a satin pillow case! This has got to be the softest case I’ve ever laid my face on. Washes well and I think I’m going to order some more! i absolutely LOVE these satin covers...they keep my hair from tangling and feels so soft and cool. i will definitely be purchasing more of these. I wish I had not purchased this pillowcase. I have thrown it away. For some reason it has pulls so when I put my face on it I keep thinking I have a hair on my face...or worse yet, that something is on me. It was freaking me out. I tossed it. "Is the euro size case listed as "euro sham" an actual zipper case?" "Actual dimensions of the XL King pillow case?" Satin pillow cases are very comfortable to sleep on and help with pillow face lines in the morning.